Once again premium cable network HBO topped the Emmy nominations this year with 111 nods, beating out close contender Netflix who nabbed 91 nominations. This season HBO's high profile limited series, original dramas, telefilms and comedies scored big with accolades for newcomers and fan favourites alike. 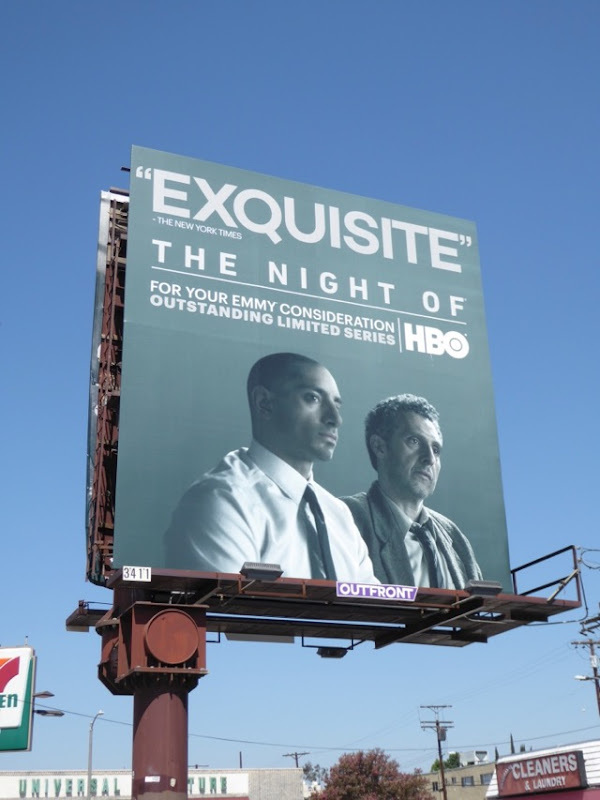 Unlike previous award seasons where HBO has stuck with the same For Your Emmy Consideration ad campaigns throughout, this year to our delight they've introduced a second wave of cohesive ad creatives for their nominees, maybe to combat all the challengers nipping at their heels. 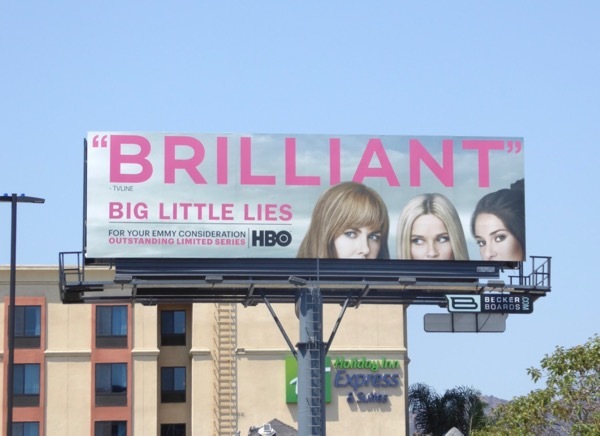 David E. Kelley's seven-part adaptation of Liane Moriarty's 2014 novel Big Little Lies scored big with sixteen nominations, with well deserved acting nods for stars Nicole Kidman, Reese Witherspoon, Shailene Woodley, Laura Dern and Alexander Skargård, plus wonderfully acknowledging series director Jean-Marc Vallée. 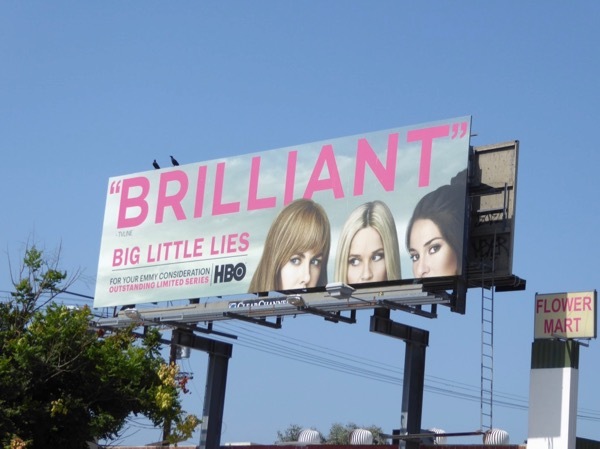 This Emmy nominations billboard for the 'Brilliant' mini-series was spotted along Highland Avenue on August 5, 2017. 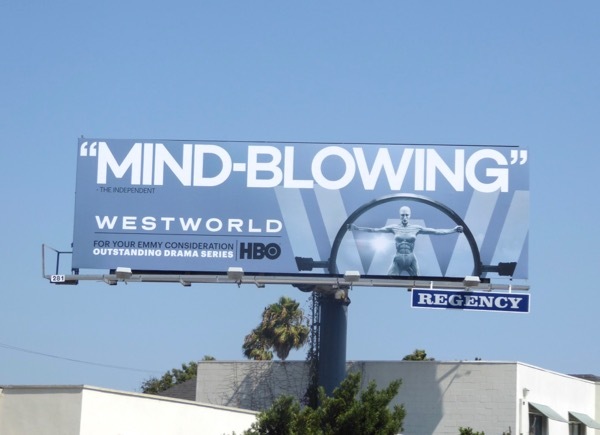 Meanwhile HBO's ambitious Westworld TV adaptation scored the most Emmy nominations, tying with Saturday Night Live with 22 nods. The sci-fi mystery based on Michael Crichton's 1973 film about a futuristic theme park populated by artificial intelligence 'hosts' entertaining the desires of its guests earned acting nominations for Anthony Hopkins, Evan Rachel Wood, Thandie Newton and Jeffrey Wright. 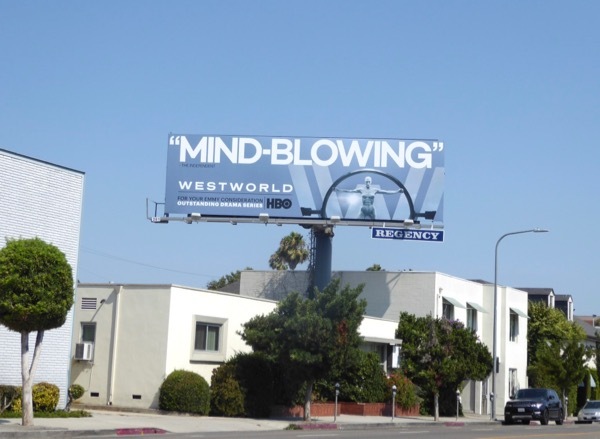 The 'Mind-blowing' show also garnered nods for Outstanding Drama Series, Outstanding Writing, Outstanding Directing, Outstanding Main Title Design and many more besides, and this Emmy nominee billboard was snapped above Westwood Boulevard on August 5, 2017. The acclaimed limited series The Night Of was also a success story for HBO this year, receiving thirteen nominations. The eight-part crime series adapted from the British Criminal Justice 2008-2009 series obviously resonated with Television Academy voters in this time of racial tensions and profiling in the U.S. 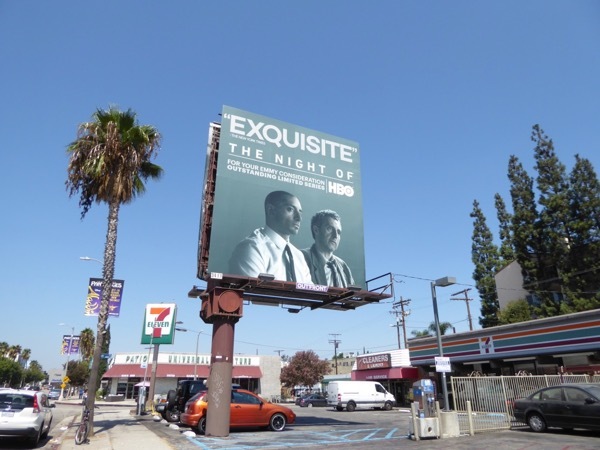 Both Riz Ahmed and John Turturro garnered Emmy nominations for their standout performances and this 'Exquisite' Emmy nominee billboard for The Night Of was snapped along Ventura Boulevard on August 22, 2017. The original HBO movie about America's infamous Ponzi scheme operator Bernie Madoff garnered four Emmy nominations this year, including acting nods for Robert De Niro and his co-star Michelle Pfeiffer. 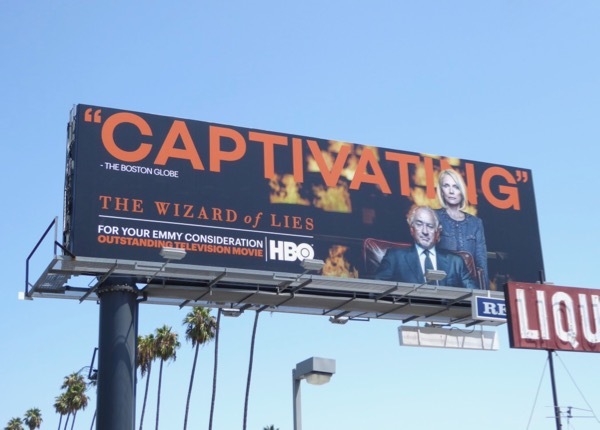 This consideration billboard for the 'Captivating' The Wizard of Lies was snapped along Sunset Boulevard on August 9, 2017. 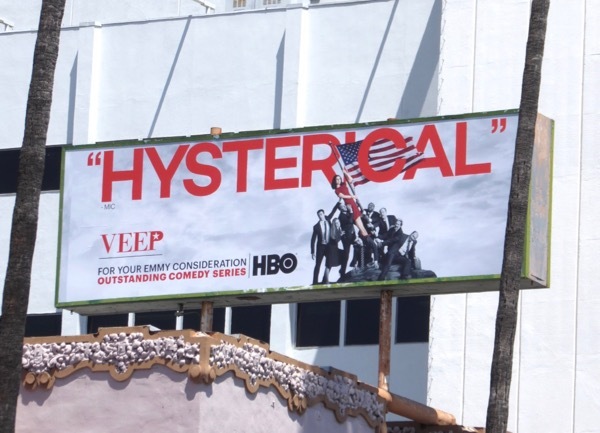 HBO's political satire Veep continues to perform well during Emmy nomination time, nabbing seventeen nods for the comedy's sixth season. Once again up for an award, can Julia Louis-Dreyfus retain her consecutive five-time Emmy crown for Outstanding Lead Actress in a Comedy Series for her portrayal of former Vice President and POTUS 'Selina Meyer'. 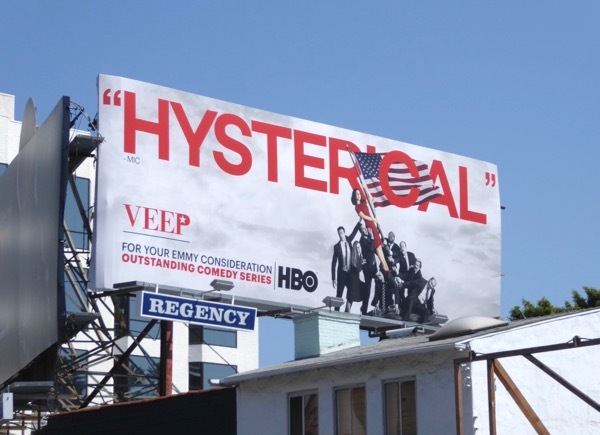 These Emmy nominations billboards for the 'Hysterical' comedy were spied above Hollywood's Sunset Boulevard on August 9 and later further west along the Sunset Strip on August 16, 2017. Speaking of comedies and HBO's Silicon Valley also secured ten Emmy nominations this year for its fourth season. Can the previous Emmy winner take home more awards this year for T.J. Miller's final season with the startup tech comedy? 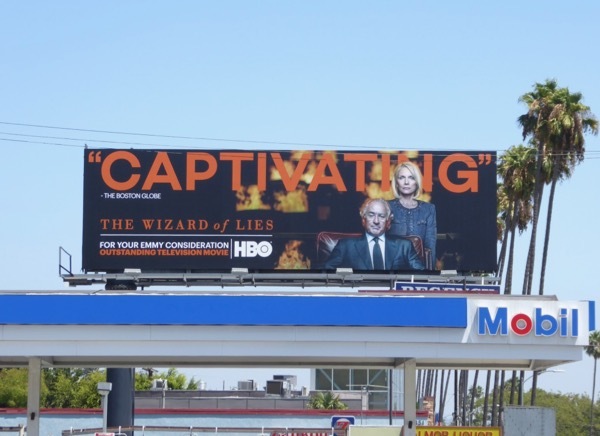 This billboard for the 'Hilarious' series was spotted along Sunset Boulevard at La Brea Avenue on August 14, 2017. Last year HBO took home 22 trophies, the year before a record-breaking 43 awards and in 2014 scored 19 wins. Let's see this September at the 69th Primetime Emmys what 2017 holds for HBO. 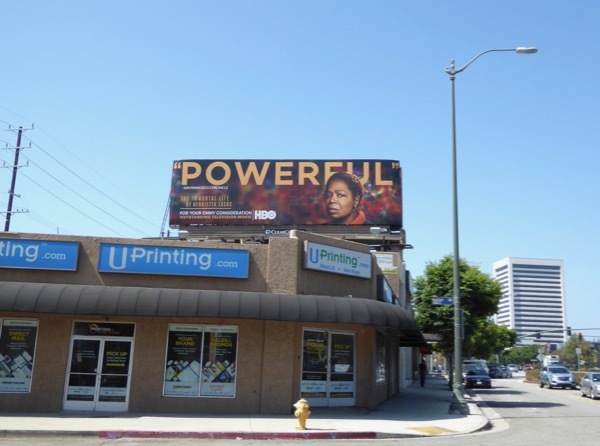 UPDATED: Here's also another example of the Silicon Valley Emmy nominee billboard spotted along Santa Monica Boulevard in West L.A. on August 26, 2017. 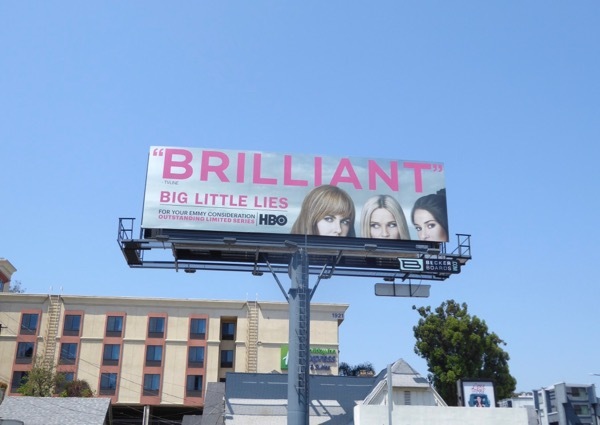 In addition this billboard for Big Little Lies was also spotted along Pico Boulevard the same day. 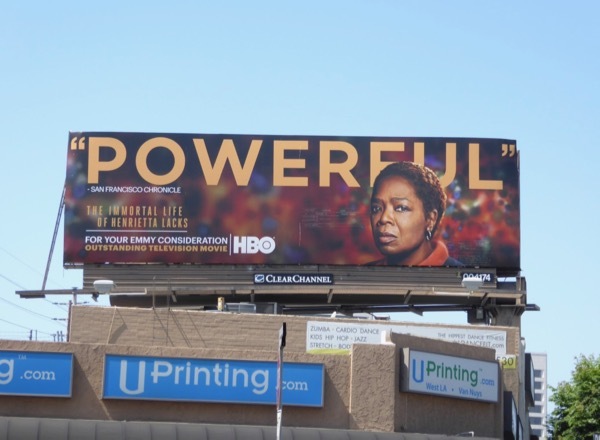 Plus this 'Powerful' Emmy nominee billboard was spied along Santa Monica Boulevard for Oprah Winfrey's telefilm, The Immortal Life of Henrietta Lacks. The HBO film garnered a nomination for Outstanding Television Movie contributing to the network's impressive tally.